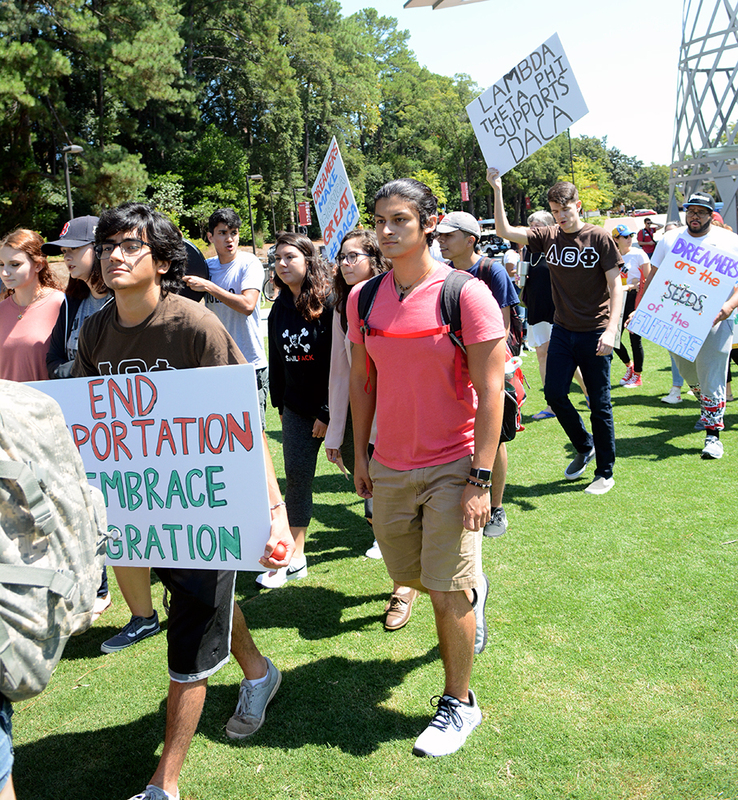 On September 8, student organization Mi Familia, in conjunction with Lutheran Campus Ministry-Raleigh, Wolfpack Students for Immigrant Rights and Equality, and Lambda Theta Phi, organized and hosted a rally on Stafford Commons in support of students affected by the DACA recinsion announced earlier this month by Attorney General Jeff Sessions. “This isn’t our first fight and it won’t be the last one we win,” said Dr. Chelsey Juarez, an assistant professor of sociology and anthropology who spoke at the rally. The rally began with Aaron Sanchez-Guerra, a fourth year student studying English and the event coordinator for Mi Familia, leading supporters in a circle chanting, “We will not go away, DREAMers are here to stay” accompanied by drums and other instruments. The president of Mi Familia, Didier Turcios, spoke first and thanked supporters for coming and reminding participants to remain peaceful. He also reminded supporters and surrounding bystanders of the focus of the rally. Dr. Mike Mullen, vice chancellor and dean of academic and student affairs, attended the event and spoke on behalf of university administration. Sanchez-Guerra shared research about the benefits of DACA to the economy and to those within it, and spoke out against stereotypes of immigrants committing crimes. “There’s no evidence that DACA-eligible immigrants commit crimes a higher rate than natives, because they do in fact have to have a clean background check,” Sanchez-Guerra said. One of the eligibility requirements for DACA is that applicants must not have any convictions for felonies, significant misdemeanors, or three or more misdemeanors. He also emphasized the humanity of those affected by the DACA decision. Lily Rivas, a first-year studying business administration, shared her story of leaving Ecuador when she was six years old and her family’s struggle to obtain visas. They won the Diversity Visa Lottery and Rivas said she didn’t appreciate how lucky she was until recently. She talked about her friends and family that did not get so lucky, and how they have to worry about deportation and not being able to attend college. While she acknowledged that many are in the country illegally, or have overstayed their visas, she also said that is not important, using a reference from the Broadway musical “Hamilton” to illustrate her point. Jackie Gonzalez, student body president, attended and spoke on a letter penned by Student Government where they pledged to fight with DACA students for their rights. The letter, which was signed by over 100 student organization executive board members, urges Senator Richard Burr, Senator Tillis and Congressman David Price to approve a version of the DREAM Act that would allow paths to citizenship for DACA recipients and future young immigrants. Student Government also hosted a table at the event that provided phone numbers of the North Carolina senators and representatives along with advice on how best to contact them. Supporters also recognized the importance of legal action in favor of DREAMers. Carl Hintz, representing Students for Immigrant Rights and Equality, also spoke about the political side of the issue, emphasizing the economic impacts on undocumented residents of North Carolina. There are over 27,000 DACA recipients in NC, the 8th largest number in the country. Yet, undocumented residents are not eligible for in-state tuition. Representatives from Multicultural Student Affairs, Student Legal Services and Young Democratic Socialists of America also took to the podium to speak out against the recension of DACA and to show their support for those impacted. The rally ended with participants and organizers marching through Talley Student Union chanting once again. Nicholas Rinz, a fourth-year student studying textile technology, and another organizer of the event, was also surprised at the turnout.